The Christmas period is a time filled with gifts a plenty, especially if you are a football supporter. The English leagues don't vacate for the holidays  Quite the contrary. All the teams have been in action and in particular during the Boxing Day fixtures, we were spoiled with high octane games and the excellent boot spots, they brought with them. We will take a closer look at them here. Samuel Armenteros (Heracles Almelo)  Nike Mercurial Vapor VIII ACC CR7 We start off in Holland, where we spotted a pair of boots, that were otherwise only intended for one player; Cristiano Ronaldo. 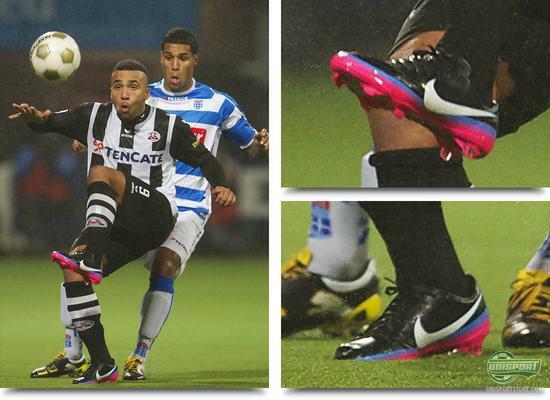 His signature colourway of the Nike Mercurial Vapor VIII had found its way to the feet of the Swedish striker Samuel Armenteros, that makes his living in the Dutch club Heracles Almelo. He was born in the nineties, and might have a good chance of breaking into the Swedish national team. Whether it will be while wearing Cristiano Ronaldos boots remains to be seen. Manuel Giandonato (Vicenza Calcio)  Puma EvoSpeed 1 Green/White Further down in Europe we spotted an awesome match of kit and boots. 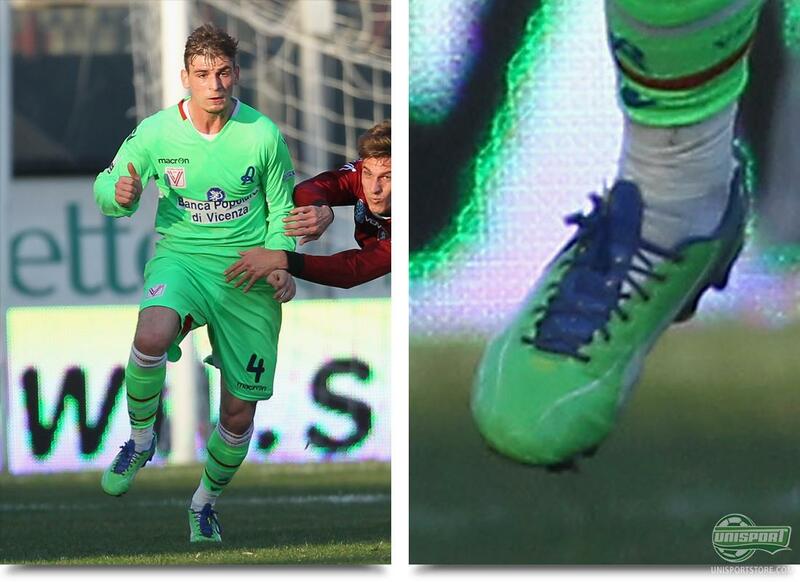 It was Juventus' young prodigy, who, this season, is helping out Serie B-club Vicenza, who was wearing the new Puma EvoSpeed 1 Green/White/Blue. They accompanied and attributed the Vicenza mint-green set very well and we can only applaud his choice, but then again, would we expect anything else from an Italian? Craig Bellamy (Cardiff City)  Warrior Sports Skreamer S-lite Blue/Orange Turning our attention to England, we start in the lower division tiers. 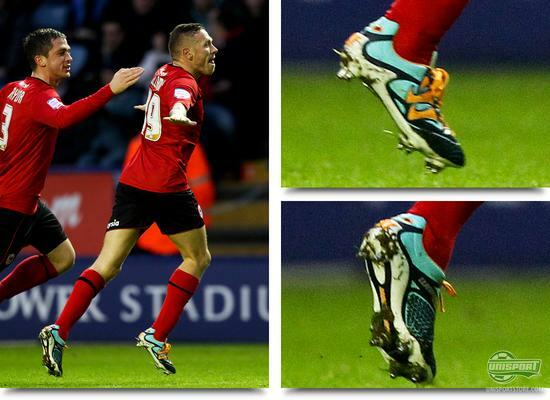 The new boy on the block, Warrior Sports, very early this year announced, that they had added Craig Bellamy to their ranks, but it was only this week, that he changed out his Adidas F50 Adizero and started using his Skreamer Pro S-lite. He joins Jonas Gutierres and Marouane Fellaini, but, unlike them, he has not had them customised and changed to leather. Giorgios Karagounis (Fulham)  Nike GS2 ACC White/Black The English capital club shocked everyone by bringing in the ageing greek, Giorgios Karagounis from Panathinaikos this summer, but so far he has been given a fair bit of game time. When last we saw the short and corpulent midfielder, he was wearing a pair of Adidas Predator LZ, but this time he showed off something a little different. He has recently taken to wearing a pair of the exclusive Nike GS2 ACC White/Black, that has otherwise been reserved for the #GS2SQUAD, but we have to hand it to Fulhams number 14, they look very sharp when paired with the London based clubs kit. Gabriel Obertan (Newcastle United)  Adidas F50 Adizero Yellow/Black We were also witness' to a notable boot change over the Christmas period, when an otherwise loyal Nike man, defects to the German rivals from Adidas. 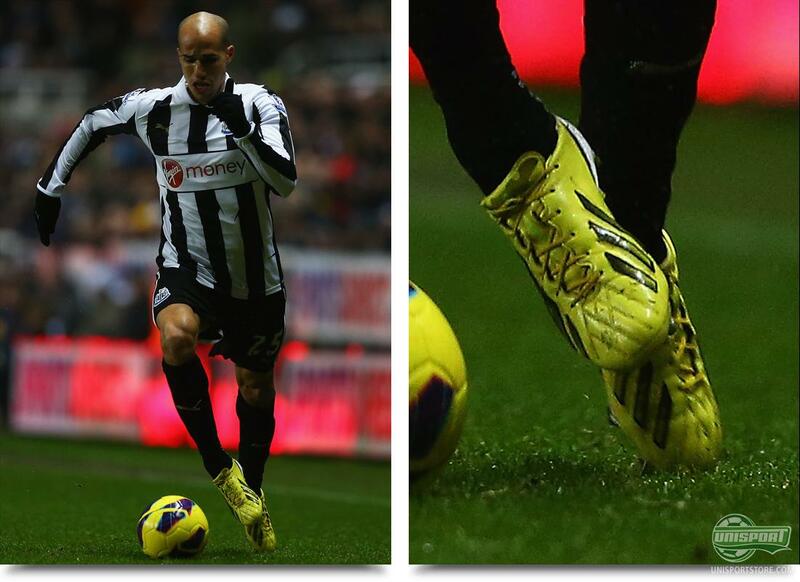 Gabriel Obertan, with a history in Manchester United, has during the majority of his career, terrorised defences with the Nike Mercurial-collection as his weapon of choice. The last two games he has however been using a pair of Adidas F50 Adizero Yellow/Black and if that lasts, only time will tell. 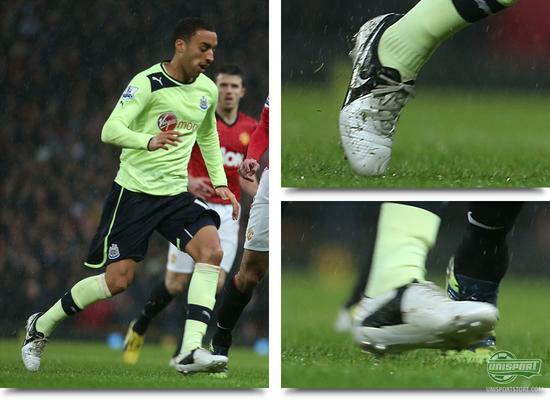 James Perch (Newcastle United)  Nike CTR360 Trequartista III Custom White/Black We love nothing more than players who design their own boots, so they match the club colours. Newcastles James Perch has been a trip past NikeID, where he crafted a pair of white and black Nike CTR360 Trequartista III, that matches The Magpies home-kit very well. We still don't know why NikeID only offers to personalise the takedown-models, but Trequartista III has still proven to be an excellent alternative to the top model anyway. 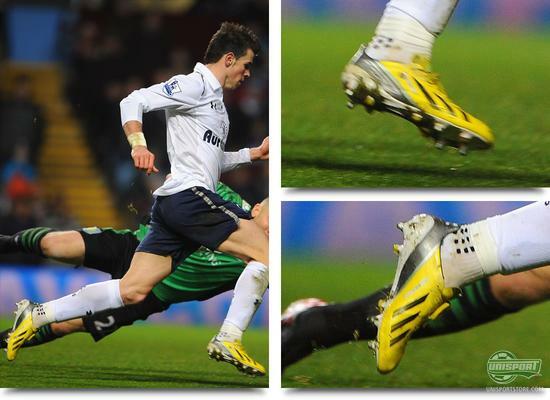 Gareth Bale (Tottenham)  Adidas F50 Adizero Yellow/Black & Trusox The Welsh winger had an excellent day at the office, when he compiled the misery on Aston Villa. The Villains recently lost 8-0 to Chelsea and there were no signs of improvement as they were lucky to only let in four against Spurs. Three of the goals came from the feet of Gareth Bale and his Adidas F50 Adizero Yellow/Black, that were accompanied by a pair of white Trusox. Maybe they gave him the edge over the, until the last two games, very sturdy Aston Villa-defence? 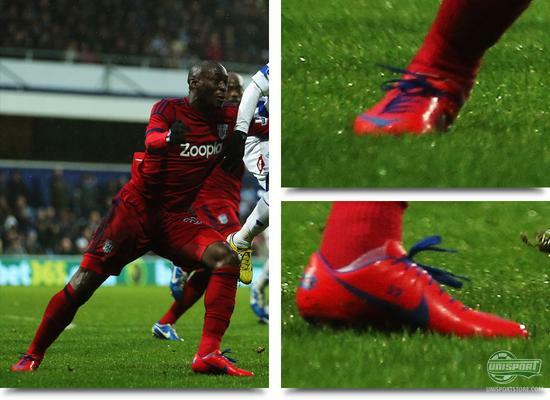 Marc Antoine Fortune (West Bromwich)  Nike Mercurial Vapor VIII Custom Red/Blue French Guyana have no more than a quarter of a million citizens, but this wont keep Fortune from making it in the Premier League. We suspect he may have rewarded himself, with an early Christmas present, because of his own and West Bromwich excellent early season form. He has designed himself a pair of super cool Nike Mercurial Vapor VIII in red and blue, that match the away-kit in stunning fashion. A big cadeaux from here, as the french would say. James McClean (Sunderland)  Nike Mercurial Vapor III Regal Blue/Silver We can hardly do a round of boot spots without including McClean and by god are we impressed by his choice this week. 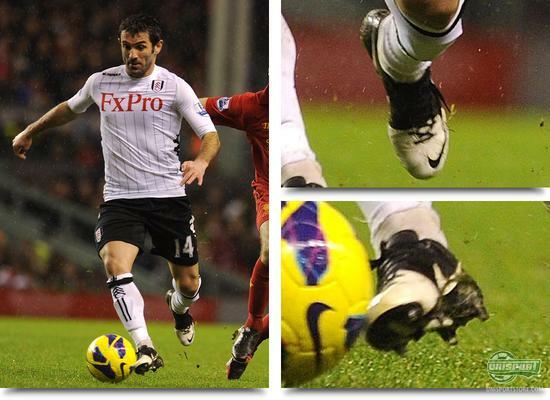 Jakob felled a wee tear, when he saw a pair of Nike Mercurial Vapor III on good old James' feet, as it these days is a very rare sight. 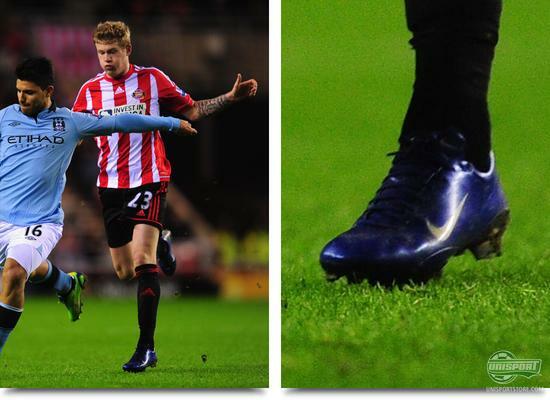 McClean has throughout the season played in anything from Adidas Predator LZ to Vapor VIII, to Nike GS and now a pair of Vapor III. James, we have said it before and we will say it again, you are always welcome here at Unisport, any day you want! As a football fan, you could not have wished for a more action packed Christmas, fantastic football games and equally awesome boot spots as a result. On top of that we only have to wait two days between each game, before there's Premier League on the menu again. Which of the Boxing Day-games did you enjoy the most? Which boot spot was this weeks best? Share your comments in the box down below.